(November 12, 2005, Vancouver, B.C.) 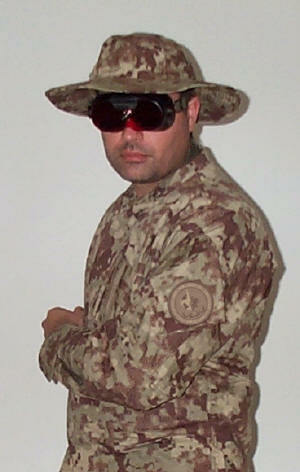 HyperStealth Biotechnology Corp. reveals the first authorized photos of the SpecAm Desert Jackal uniform. The SpecAm pattern was designed for global operations so HyperStealth designed the pattern with the most common background noise found across this broad spectrum, given their only requirement was to make sure no true black was in any of the color schemes, they were able to design what should work and not what others thought it should look like. 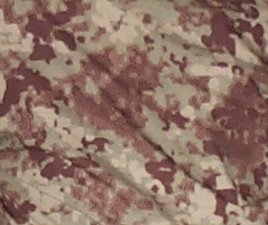 While SpecAm was designed from natural leaf formations as a scalable fractal (feedback loop) to both blend and disrupt the user from the adversary, the transition to an acceptable desert camouflage was made by shifting the colors to allow for greater blending with the most common desert colors - among the three lightest layers which accounts for approximately 75% of the overall pattern. The 4th layer uses a common red/brown found in desert shadows and rocks. This red/brown is the disruptive element of the pattern designed to breakup the soldiers shape as the human brain can easily identify the shape of the human outline if the main colors don't blend in certain environments and there is inadequate disruption within the pattern. Examining a piece of camouflaged patterned fabric on the ground to check the effectiveness is very different than a person wearing the same pattern in the field at 75 yards distance. Desert colors have a high range of variability: light tan / pink / grey / light green / red and brown. The night element must also be taken into account as bright desert colors in a uniform tend to shine at night - hence the desert night pattern the U.S. came up with. The Kingdom of Jordan's KA2 patterns (designed by HyperStealth) tend to be a tad on the darker side - two reasons; the deserts are darker than most but the pattern works extremely well at night. His Majesty, King Abdullah, given his extensive military education and service is very in-tune with the fact that many combat scenarios are done in the cover of darkness and your camouflage should work under those conditions as well as the day time. 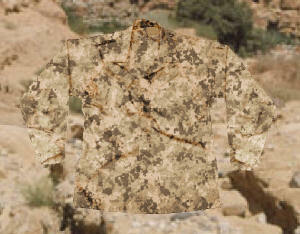 HyperStealth used this lesson from the King to color SpecAm Desert Jackel as the pattern lends itself to a darker desert camouflage than the current U.S. Desert, the U.S. Army regular and reserve forces are now replacing their current Desert pattern with ARPAT (Army Pattern) which will operate in all theaters of operation as one color scheme. The photos on this site are of the SpecAm Desert Jackal color scheme (color differences are due to different lighting conditions). SpecAm Desert Viper is a brighter variation for lighter deserts. The Fader Pixels (miniature pixels of equidistant placement) - specific to SpecAm's digital pattern, create a number of extra simulated colors at distances of greater than 15 feet. You'll notice in the close up samples provided that these fader pixels do not surround all portions of the pattern, this was done so regions of the pattern would appear to fade into other colors while others have a strong disruption between the colors which throws off the ability to focus on any one section. This creates a depth perspective that the brain has trouble recognizing. 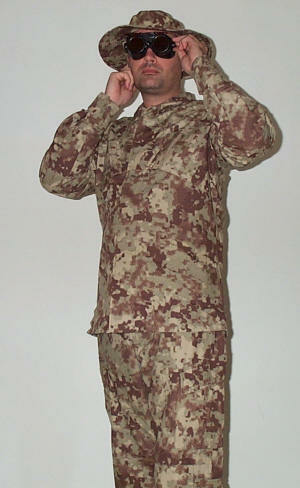 Why does the ACU use Velcro pocket closures, they're loud and tend to require dirt removal? Many uniforms up until the late 1990's had outside buttons, MARPAT (U.S. Marines Pattern) uniform was modified with hidden buttons so they wouldn't snag on objects in the field. Velcro was used for the chest pockets. These pockets were placed on angles for easier access when wearing load bearing vests and/or flack vests which were now common in combat as buttons under the vest tended to dig into the body. For the ACU with the addition of shoulder protection, leg holsters, packs, and extra harnesses for modern special operations it was decided to remove all buttons from pockets on the ACU except for the back pockets where they are concealed. Under combat conditions, soldiers with proper training have been able to maintain the Velcro so it continues to be clean. Zippers from the ACU (used for the same reason Velcro is used on the pocket closures) were replaced on the SpecAm with button fly and concealed button opening on the jacket as the zippers tend to jamb with sand, dirt and debris. "SpecAm Desert Jackal" is a Trademark of HyperStealth® Biotechnology Corp.